Theodora Taylor is a writer of both contemporary and paranormal romance. She made her mark in self -publishing and runs the review blog, IR Book Reviews. She is now also contracted with Harlequin’s Kimani Romance line. Theodora recently released the third and final installment if her paranormal Alaskan Princess series. RK: Tell us about writing your first novel. THEODORA: It was a really amazing process. It started with, “I think I could write a romance novel…” And it ended with me actually writing one—THE OWNER OF HIS HEART. I put it up on Amazon and was really pleasantly surprised when it was received well. RK: You write both contemporary and paranormal. What appeals to you about the paranormal genre? THEODORA: I’m definitely in it for the world building, but I have a love, hate relationship with world building. It allows you to do some really neat stuff, and it’s really amazing to see an alternative world coming alive. But It can be a huge bear at times. I love both contemporary and paranormal, but I’m usually breathing a sigh of relief when I switch back to contemporary. RK: You recently became a hybrid author-doing self pub and contracting with Harlequin’s Kimani romance. How did that come about? THEODORA: I got an email from a Kimani editor out of the blue, asking if I wanted to talk about publishing with Kimani. I think they’re scouting more IR authors—as they should, because IR is both awesome and sells. I’m excited to see who else signs on, and I’m thrilled to be doing a couple of books and one novella for an anthology with them. I’ve always wanted to write “a Harlequin,” and now I have! So that’s crossed off the old bucket list. First up is the DIM THE LIGHTS anthology (releasing on April 29, 2014). I really loved the hero in this novella and yay, the anthology got four and a half stars from Romantic Times, so it’s going to be a great introduction to the Harlequin Kimani fans. RK: What inspires you to write a novel? Do you have a specific writing routine? 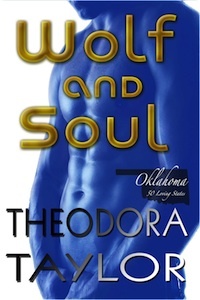 THEODORA: I usually decide I want to write a novel for a specific male character—for ex., a deaf shifter or a blind football player or a Russian billionaire or a Viking werewolf—and then the rest unfolds from there. I have the same routine for every novel. Outline, Rough, Rewrite, Rewrite, Copyedit, Rewrite. Publish. Start the next project the following Monday. RK: What do you want readers to take away from your books? THEODORA: I really want them to be thoroughly entertained. If a reader ever wrote me and said, “I bought that book and it was completely boring!”, it would be so hurt. RK: Alien invasion or zombie uprising…which are you more prepared for? THEODORA: Zombie uprising for sure. Television and movies have done a good job of preparing us, I think. But I don’t know if I could go on in the world without a steady supply of e-books and television. RK: If you could choose one animal (or plant) to be given the power of speech, what would it be and why? Learn more about Theodora at her site, follow her blog, or catch her on twitter @TheodoraTaylor. Nice interview. Congrats on the new book with Harlequin! I loved doing this interview. So glad Harlequin spotted your talent.